We are living in – as the Chinese might say – electorally interesting times. India has just collectively decided to hand its governance to Narendra Modi who is variously described as the subcontinent’s economic great white hope – its Margaret Thatcher – and a man who, as chief minister of Gujurat, has been accused of initiating and condoning the deaths of over 2,000 of his citizens. In Europe a frankly xenophobic, not to say sometimes downright racist party seems set to come first or second in the UK European elections and a clown is predicted to do well in Italy. And in the run up to the next US presidential contest, senior Republicans are weighing the consequences of allowing their party to be represented by tea party firebrands. In all of these cases, people who are happy with the outcome of the vote will praise the democratic process while their opponents will shake their heads at the idiocy of the electorate. The wine world has its own highly conflicted views on democracy when it comes to wine competitions. Every competition seems to have its own way of selecting its judges. Decanter’s DWWA likes to be sure that wines are tasted by people who “understand” them and their typicity. So one set of judges gets to taste Bordeaux all day while another gets Barolo. Or Bulgaria. The IWC is fierce about the tasting skills of its panels, but a little more relaxed when it comes to regional expertise. The philosophy is to favour tastiness over typicity. Then there are the OIV tastings at which a set of people from a wide variety of countries are given wines to taste without any notion of where they come from. Typicity is very evidently not very high on the OIV’s set of priorities. 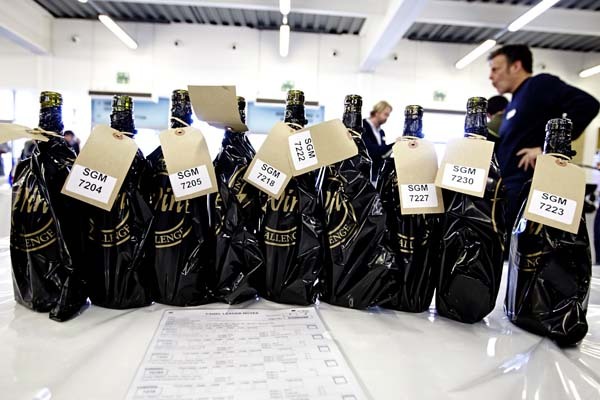 Other competitions are more influenced by a high proportion of winemakers or sommeliers among their panels. Interestingly, Australia has switched from the former to the latter in its competitions and this is reflected in a move from focusing on technical flawlessness to a “naturalness” and food-friendliness. And then, of course, there are the competitions that hand the responsibility to the consumers. Palate Press does just this in the US. Or nearly. Before they’re subjected to the democratic process, all its wines go go through a preliminary screening by professionals “to avoid sugared plonk from getting votes from serious wine lovers’ dates”. In the UK, when Charles Metcalfe and I started Wine Magazine in the early 1980s, we decided to have pro-am panels at every monthly tasting and to publish their reactions. The problem with this model was that while a number of wines often did well with both groups, there were lots of occasions when we were forced to print reviews that effectively said “On the one hand… And on the other…” We also had heated discussions over wines that, in the professionals’ views, needed to be “understood”. This was all fascinating of course, but we were trying vey hard to publish a magazine that paid its way by attracting and satisfying its readers. And when we talked to those readers they told us in no uncertain terms that what they wanted was clear recommendations. Everything else was, as some bluntly said, self-abuse on the part of the publication. Except they used a more graphic term. In any case, inviting consumers raised the Palate Press Problem: did we want wine enthusiasts? Or their dates. Some consumers know more than some experts; others don’t. If we turn our overly myopic vision to subjects other than wine, the challenge of deciding between different kinds of expert panels and democracy become clearer. At the Eurovision Song Contest and at TV talent shows, there is often a gap between the “public” and expert vote. Who gets it right? In the UK and US people charged with crimes go before randomly chosen juries. In Germany the decision is made by a judge and two “lay judges” – usually “responsible, middle class citizens”. In South Africa Oscar Pistorius’s fate lies in the hands of a single pair of legal hands. Is one of these systems necessarily better than the others? When buying a £500 camera do I want advice from a mass of consumers who might not even have seen, let alone used, all of the alternatives? Do I want it from a set of professional photographers? Or keen amateurs? Or journalists? Do the professional snappers use their cameras in the same way as I do? Do the amateurs know enough to test it properly? How knowledgeable are the hacks? If the people judging the camera are in another country, does that affect the way they assess it? Are there cultural differences? In the words of a clever person describing the challenge of making peace in the Middle East, if you think you know the answer, you didn’t understand the question. Previous post: What’s the point of wine competitions?